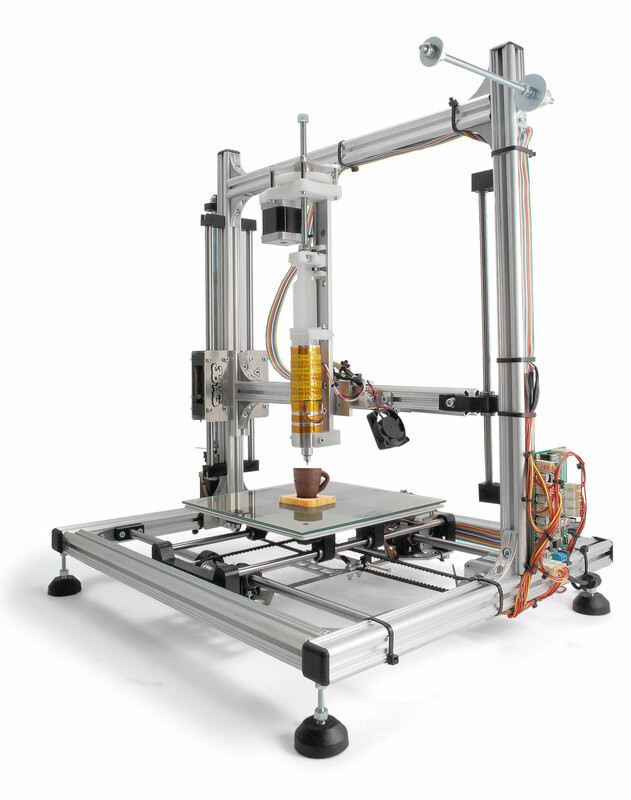 Home > Open Source Projects > 3Drag is now printing with Chocolate! 3Drag is now printing with Chocolate! Maitre Chocolatier is born or made? Well, when it comes to creating original chocolate mixes you will probably be born, but if you want to succeed in the art of pastry, then everyone can be made: you just need to have the right tools and equipment. One of these is our 3Drag printer, that modified with a real pastry bag for precision work or a heated syringe is suitable for plotting lettering and lines using any type of chocolate: milk, white or dark. All this, with the advantage to design the object or the pastry directly in computer graphic. 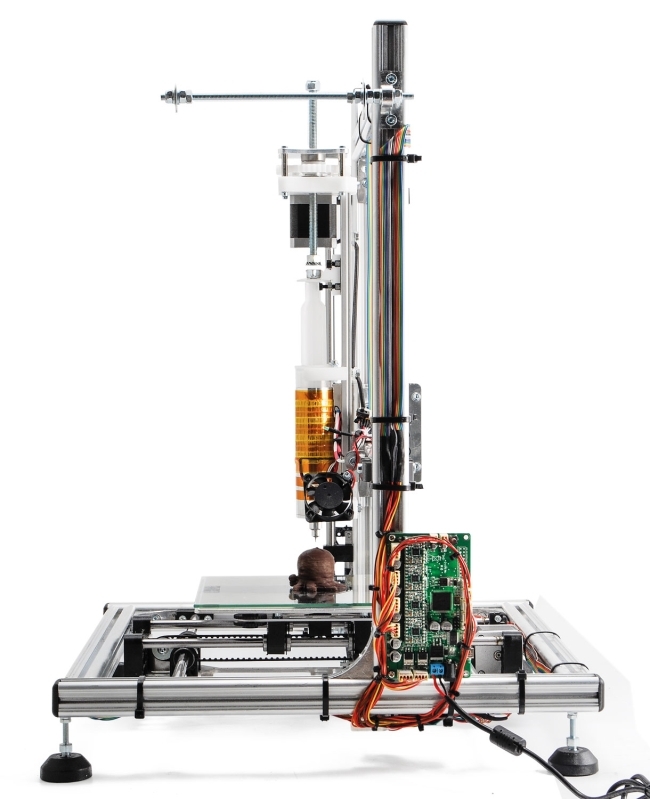 The 3Drag is a FDM 3D printer, but its mechanisms are liable to print not only with plastic, but also with any other material provided: it is sufficient that its melting point is at relatively low temperatures. Replacing the print head with something able to inject into an extruder a moldable food, such as cream, chocolate, jellies, but also soft batters, allows to produce sweet and savory products with decorations and shapes also particularly challenging. Hence, the idea of using chocolate, which is easily moldable and allows you not only to create objects quite “tough” and funny, but also to decorate cakes with shapes and letterings without causing any stress that could deform the mechanics of 3Drag or make them loose. More difficult would it be to depose materials such as dough made of flour or something. To use chocolate for decoration, for instance to sprinkle it on a cake or to make chocolates of various shapes, you need to “melt” it and sometimes to “temper” it. “Melting” means obviously to melt the chocolate, make it malleable, while “tempering” chocolate is a more complex operation and involves a thermometer (preferably digital). Our 3Drag is designed only to melt chocolate, keeping it at a high enough temperature to melt chocolate but without altering its physical structure. To have the 3Drag printing chocolate objects we assembled a special extruder (to replace that used for extruding plastic materials) starting by a very common 60 ml syringe. 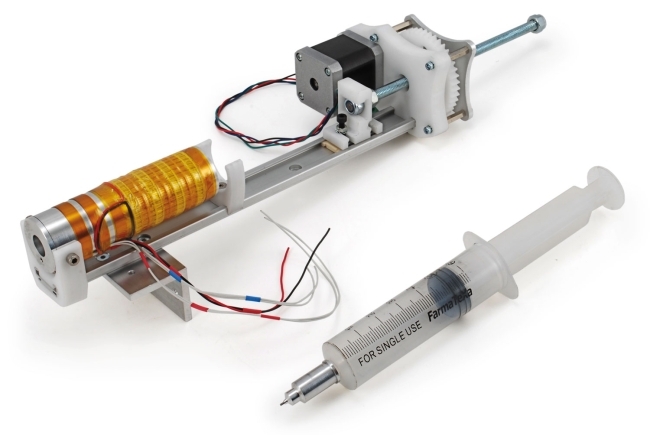 A NEMA17 stepper motor drives its piston and a heater to maintain the chocolate contained in the syringe at a temperature of about 32 ÷ 33 ° C wraps the cylinder. Chocolate must be melted before being extruded through the syringe needle (having an internal diameter of 0.9 mm); its fusion is achieved by activating the heater in which is inserted the syringe, without exceeding the threshold of 33 ° C (so keeping the chocolate “tempering”). For this reason, the control board constantly detects the temperature of the heater thanks to a NTC 100 kohm thermistor installed directly on the body of the aluminum cylindrical heater. The loss of “tempering” of the chocolate would make impossible to print objects that develop in height, and then the chocolate itself would not be able to solidify at room temperature (24 ÷ 27 ° C). 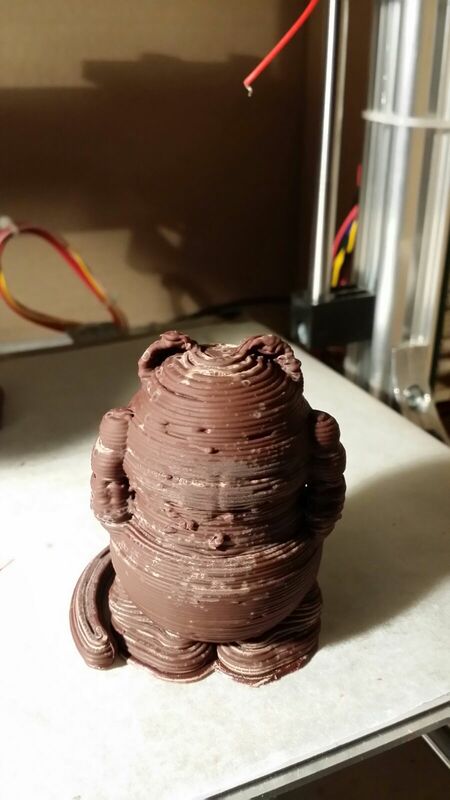 Aside from maintaining the temperature below that threshold, you have to deal with the chocolate cooling time, which affects the printing speed. In fact, depositing a layer of melted chocolate (it’s hot) on a lower layer not yet solidified can deform the object; so the application of a layer must be carried out only when the underlying one is cool enough to bear both the weight of the chocolate above and the heat supplied by the melted chocolate deposed. Let us say that if you are working with a relatively small chocolate amount, like the quantity that can come out of a needle with an internal diameter of 0.9 mm as that used in our tests, you can go fast. In any case, you have to choose, basing on your experience, the appropriate printing speed testing adequately the functions and settings of the printing software (Repetier-Host, Heal, etc). To speed up the chocolate cooling process we decided to use Peltier cells, to realize a compact airflow cooling system blowing directly to the zone where the melted chocolate is deposited; this solution has proven to be the best. The system that we use to depose the melted chocolate consists on heating the body of the syringe and the needle even more, through a special electric heater resistance. The needle is inserted into a perforated cylinder that let it pass through and hosts the coupling. The whole system is able to bring chocolate to the required temperature and keeps it stable. In this way, the chocolate close to the needle tip melts and can leak. For this to happen, you have to push the piston of the syringe by applying a regular and continuous pressure: here comes the activation of the feeder, which consists of an endless screw that pushes down the piston itself. If all the chocolate in the syringe is “pre-softened”, that improves the whole process: this is the reason why the entire syringe body is inserted into an aluminum cylinder whose dual purpose is to support the syringe and transfer the heat from the heater (the one that heats the needle). Since aluminum is a good heat conductor it transmits very well the heat to the syringe but on the same time its outer surface tends to waste heat; For this reason, we decided to wrap the outside of the cylinder with a heater in Kapton film. The syringe may be loaded in two ways: by pouring inside it the chocolate already melted at low temperature before inserting the syringe into the cylinder, or by putting inside the syringe chocolate flakes and melt them thanks to the syringe heater. 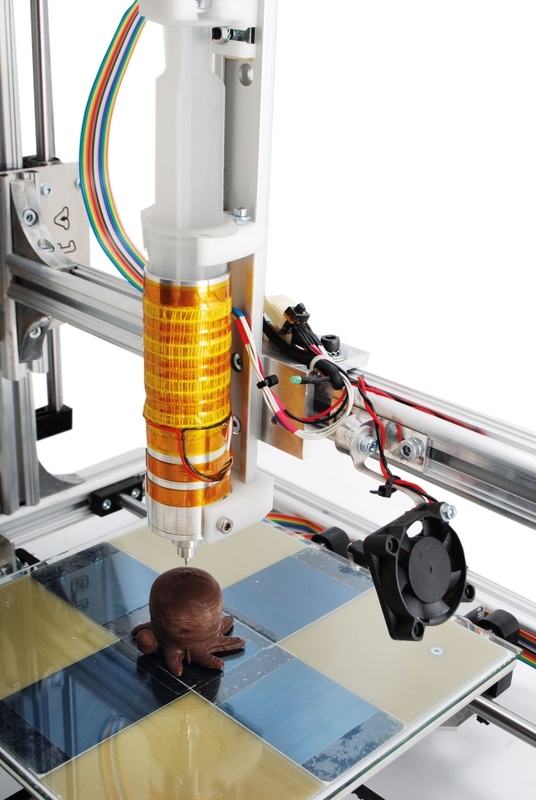 To print with chocolate it is necessary to make some modifications to the printer, but just limited to the replacement of the original print head (and its feeder) with an extruder ad hoc. 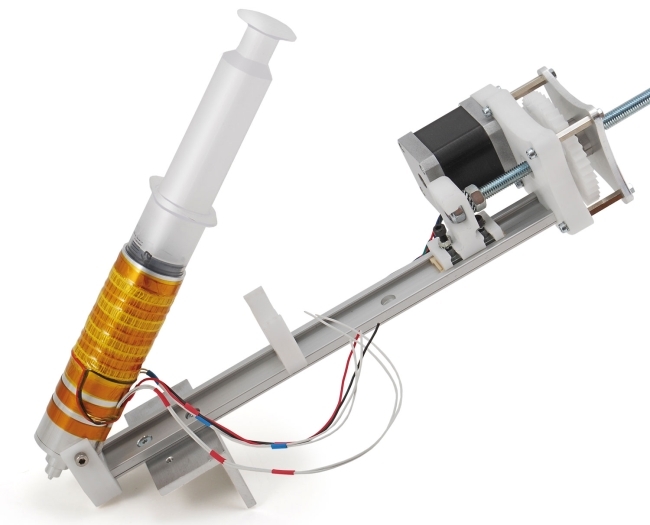 Therefore, you have to remove the original head from the horizontal rail of the print head holder and fit the new head, which consists of a syringe and its special housing that has the dual responsibility to support and heat, as well as the endless screw mechanism that presses on the piston to control the injection of the melted chocolate. The completely new head is supported by a guide, which is then anchored to the horizontal profile of the 3Drag. A NEMA17 2.5A stepper motor, the same used for the extruder for plastic, drives the feeder that pushes on the piston of the syringe. The heating element to be inserted in the cylindrical aluminum block is 15V / 33W, while to coat and heat the cylinder you have to apply the “Flat” heating element coupled with a NTC axial 100 KOhm thermistor. Fix the full cylinder to its support using two M4 screws and then insert the needle in the appropriate “aluminum sleeve”; then insert the syringe into the cylinder until you get the position; by doing this, make sure that the syringe is free to swing front to about 45 °. The mechanical modifications to the printer end here. In order to use the printer as 3Drag for chocolate you must also update the firmware of the electronic board. The firmware “Marlin V1 (LCD ON, Choco ON)” can be downloaded directly from here. Obviously, the firmware can be changed to your preference every time you wish, depending on the extruder mounted on the printer. This change moves the protection threshold from 170 ° C to 10 ° C.
The last parameter (600) indicates the rotation speed of the motor. This value has been calculated empirically but gave great results on real printing. The modified firmware is available for download. You can use the Arduino IDE to program the 3Drag Controller (like Arduino Mega2560). To disable the hot bed you have to insert a 120Kohm resistor on THERM2. As already mentioned at the beginning of this post, we must remember that the cooling time of chocolate layers is much longer than that used when printing with plastic. We therefore recommend a printing speed of maximum 20 mm / sec to have individual layers of chocolate cooling down properly. In the Slicer parameters, we must set the nozzle diameter to 0.9 mm (you can also set it to 0.8mm to “cheat” the slicer and then make higher definition prints), the layer height to 0.7mm and the extruder temperature not exceeding 35 ° C.
As for the 3D prints with plastic, it will take several tries to get the best results. The configuration parameters also depend on the shape of the object, the type and quality of the chocolate used and the ambient temperature environment in which the printer operates. Therefore, the determination of the parameters is the result of personal experience gradually gained into this field. because it’s called K8200, I want to buy one but because of the upgrade opportunities for chocolate/pasta extruder or mounting a Dremel on it. Any tips? Hi, I have sent a request regarding the 3Drag Printer and Choco Extruder but it seems like there is no reply. In the store they are available. Hi, I have just come across a link with very good and detailed instructions on how to build the Chocolate Extruder in Italian……. Hope that this will be of help to you all….. Via Google translation is easy to get a native translation. Many thanks for your feedback….. It was not me that prepared the instructions! All our thanks should go to the original authors of the article……. Can anybody give me a hint how to connect the chocolate extruder to a 3d printer with 24 V power supply? For the heater cartridge I have 12, 15 or 24 V available. For the flat kapton heater there’s only the 5V offered by OE.org. Is it possible to connect 15 V + 5 V in series or is it better to go with 24 V + 5 V in series? Hello, I have assembled the extruder but in the end when im trying it out i realized that it retracts instead of extruding… what can I do? I have a problem,I don`t know how to set the proper speed for the motor.I tried several speed ,and I found if the speed was too high may cause the jam of gear and stop the motor.if the speed was too low the volume of the chocolate was not enough to print.Can someone give me some tips? 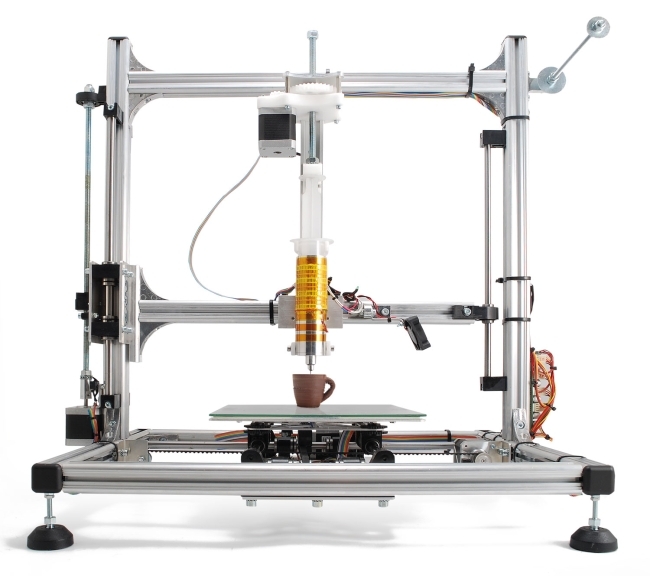 hye, can ur chocolate extruder being assembled in standard reprap prusa i3 3d printer?. What are the additional parts or modifications that i need to do for ur chocolate extruder kit in ur store to perfectly work with my standard prusa i3? is this printer capable of retractions? 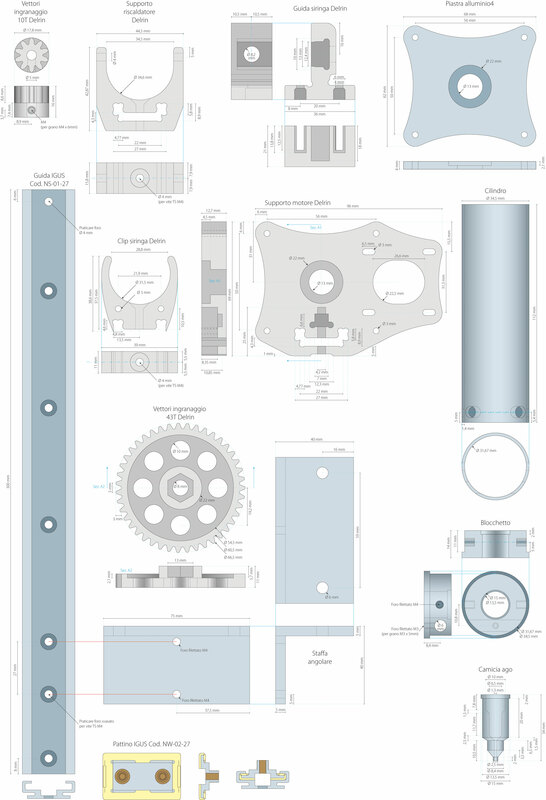 can you put up a better version of the 2d plans for the extruder. Its too blurry and hard to read. This product is shipping to Brazil? am not sure I may have a problem in updating the electronic board or in the firmware for marlin choco ??! Have you changed the firmware? You have to use Arduino IDE to upload the firmware (sketch) inside the main board. Do you recommend me any website that explain in more detailed ? I mentioned to you before that I followed every thing step by step . But still have stepper motor not working , its written in the 3d Repiter- host that ( cold extruded prevent ) >>?? is there anything I can do to overcome that ? Ho comprato il kit da piu’ di 3 mesi e ancora non sono riuscito a fare un oggetto di cioccolato che uno. Ma non ci sarà il trucco? Poi, alle email e ai tweet non rispondete, cosa devo fare ancora per la vostra attenzione? Chocolate inside the syringe should already be loose. The extruder heater only serves to keep loose, not to dissolve it. Be sure to put the aluminum jacket around the needle. The needle should be ours and must extend from aluminum for a millimeter. Yes of course. I bought and built the suggested cooling system with peltier cells. I think you never read the email I sent to you 18 days ago. In anycase i have a theory that explains why the chocolate flow decrease. Because the chocolate flow has no control (when the chocolate is melted then flows down by the gravity force, maybe it needs a valve synchronised with the step motor) it creates an empty space like a inverted cone just between the rubber piston and the hole at the bottom of syringe. I notes this many times after I toke out the syringe for cleaning. You can reduce the flow rate. If you are try to close the upper layers yu have to create an infill (as a normal plastic 3D printer). Do you have a stl file of the cup printed in the example above? Hi Boris, thanks for this. However, I guess what I’m looking for is an stl that contains the printing instructions. Do you have some recommended settings for the slicr that I can use? I don’t manage to get this cup to print correctly. Hi, has anyone had problems with the connection to the printer being dropped all of the sudden? The board starts blinking red and the computer cannot find the USB port any more. Anyone that might know what causes this? We got many problem with this printer and we don’t know how to resolve those problems, I tried sent many email through this website (CONTACTS) but unfortunately till now no answer!!!!. I’m wondering how to sell this machine without good custom services ?!! Please don’t buy this product, I would advise you don’t buy it. Many problem many bugs.Further, no service customer!!!! The board was damaged I bought new one, I got documentations in Italian I sent email written in the manual all are wrong!!!! You can find all info in this site. We don’t receive any mail. We have also a RMA service. In this same page where you replied there is my first post and in the same time I sent you many messages through CONTACT. And I bought new board due that the first was damaged and I tried to upload the choco firmware can you help me ?!! Can you give me any email that of custom services?!! I tried to contact them using the address which you gave to me but unfortunately any answer!!!. Please can you help me and answer to my questions? Can I ask you my questions here? Yes this I used a lot, and I tried to sent using two different email address but no feedback? system in blue (with the horn) we see in the video? I think it will be better than the one with the ring. Could you ship the product to UAE? How long does it take the printer make for example a chocolate cup?